Denim, denim, denim; indigo, faded, raw-hem, embellished, coloured. Any type of denim. I'll hold my hands up to having played it fairly safe this past winter with regard to the material, more often than not changing in-and-out of identical pairs of skinny jeans. However, now that we're transitioning from winter to spring and it's warm enough not to conceal every square inch of the body in multiple layers, I'm back to looking at other ways of wearing denim, starting - of course - with a classic denim mini skirt. I have a feeling I'm becoming emotionally attached to Zara. Seriously. Every time I walk into one of their shops, I leave with a greater love for the brand. On this occasion, it was because of this gorgeously understated, classic denim skirt; a modest design that allows for one million and one styling options. 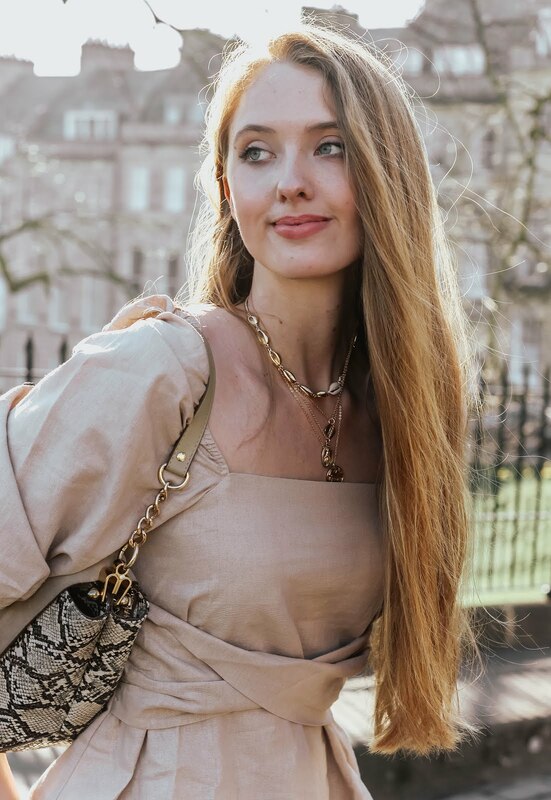 The 'summer-soul' inside of me is desperate to bring out the delicate silk camisoles and sheer blouses, but the hairs on my arms are begging me to remember it's still actually quite cold. So, jumper it is then! Really, it's difficult not to fall head over heels in love with chunky knit jumpers, the type you can throw on for the day and not give a second thought to. Personally, I find myself drawn to 'cosier' pieces when other elements of an outfit are less so, such as thigh-high leather boots. I picked up this blue and white knitted piece a few days ago at GAP, a store I've recently rediscovered and learnt to appreciate. Basic, staple pieces that act as the backbone of an outfit, similar to how primer prepares for makeup. Funnily enough, I've found GAP can be fab for finding gems from across all departments and more often than not those you least expect. Menswear, petite, tall - they can be perfect places to look for oversized gems, or equally, tight tops ideal for layering. If you follow me on Instagram, you'll know I recently indulged in a rather pretty treat by Chloé, the beautiful Elsie Medium! I spent a while switching from bag to bag, though eventually settled on this gold-chained beauty thanks to the classic design and practical size. Swoon! Jewellery-wise, I've kept it fairly minimal with a simple choker and stacking rings. Chokers are ridiculously easy to make, I'm no seamstress and yet this thick-band velvet choker took about five minutes to whip together! If you're looking for a speedy way of finishing it, opt for a velcro fastening, though otherwise I'd suggest picking up ribbon clamps. As these photos were taken, small bugs darted in all directions, birds were singing and the sun beamed down and fell on my back until it was warm. This time of year truly doesn't receive the praise it deserves, I mean, at the very least it allows for jumpers and mini skirts to be worn together without risking imminent death by freezing or overheating. Three cheers for March! This post just reminds me of how much I need to add more denim to my wardrobe, I really don't own that many pieces. I'm falling more and more in love with Zara as well, I feel like the majority of my clothes come from there now. You look gorgeous! Love the sweater and bag!! I really appreciate Zara too and the Gap is great for subtle staple pieces to mix and match with more in your face items. Love the cozy knit too! I can't wait for the time I can wear sweater and skirt again, I am so sick of pants! LOL! You look great, Gabrielle! This is such a great look Gabrielle, and I think I'll have to keep GAP in mind for Fall! You're so beautiful, your hair is angelic! I love your jumper, the denim skirt is perfect for spring. I also love the rings you chose to wear with the look, very lovely! I'm glad denim is back in style! Such a lovely outfit, Gabrielle. :) Nice Sunday! I'm like you and you'll always find me in a pair of jeans, but as you've proved, denim can be worn in so many other ways! My favourite is a pair of dungarees - can't wait to dig mine out when it's warmer! I love everything here. From the outfit, to the lighting of the photos and to you. You are soon amazingly beautiful. Lovely outfit! I love demin too! Your hair looks amazing as always! Such a beautiful photo shoot! You look absolutely amazing and chic! I love the cute and delicate accessories! Have an amazing week! This outfit is so cute! I love the sweater casually tucked into this denim skirt. I love this double denim look, let's hope the sunshine is here to stay! I'm a big fan of Zara as well and it's become quite dangerous since they opened a shop just a short walk from my house recently. I've actually been avoiding it cause I'm on a bit of a shopping ban. Your denim mini skirt is a lovely buy and definitely a great transitional piece that you can wear through summer and early fall. Such a cool skirt! Zara can be a great treasure trove of chic items. And you picked s gorgeous Chloe bag! An amazing look and stunning shots! love the blues ootd. and that cute choker to add to it! Classic is always the way to go. I know how it feels to finally make a big purchase like this it makes you feel amazing! Congrats & you look great! These photos are utterly stunning. So editorial, high fashion, model-like you are! I'm a fan of denim too, but I don't particularly favor blue tones, deep indigo maybe but that's it. I always feel like they look odd on me and I have trouble styling them with anything other than white. You look gorgeous! Denim never fails, it's my favorite! Love all the navy/blue you are wearing! I'm addicted to chunky knits, they're so warm and comfy, who can complain!? Yes to denim skirts!!! I wish it was warm enough here to wear one!! You look to amazing for words! You look stunning, Gabrielle. This outfit is perfect. P.S. I can't stop lusting over your bag. Yay March! Thank you for bringing in the first signs of spring with you! I love your denim and knit jumper ensemble! As for me I am looking a denim jacket. Also, I never knew you made jewelry. You are a talented young lady! I like very much your outfit and the accessories! Gabrielle you always look so flawless!! :D Denim is definitely one of my favourites. I absolutely love the colour and style of your denim skirt, the whole look is so chic! I swear to god you are literally just an angel. You look so beautiful in this skirt and sweater, Garbielle. Nice cosy look put together here, Gabrielle. I especially love the blue jumper and love that you took such great detailed visuals of your outfit. That dainty stacked little starry and teardrop ring is my favourite accessories. Nice post! Have a lovely week, my friend. I have really been loving denim skirts lately, and the sweater + skirt combination fits perfectly with the season. Love a chunky knit, and love the flecked detail of yours! And obviously your DREAM of a bag! Heart eye emojis floating around over here. Beautiful outfit - especially <3 the bag! Gorgeous outfit! Love the colour of that jumper with the shade denim. They look amazing together. And I love how you paired this with a diy choker and boots. You look amazing! I agree, Zara is such a great brand! Love your new bag. Love the denim skirt. Reminds me of high school, only more grown up & way more fashionable! haha Great look. Lovely photography and the outfit is so pretty :) Your new bag is so beautiful! Denim is always the best choice, you look amazing with this outfit, simply perfect! Yes! Love that kind of weather with sunshine and bugs darting everywhere haha. Love your outfit especially the blue! That's one fabulous date with denim <3 :) Adore the look! Gabrielle, you look gorgeous as always! I love blue on you in general because I feel it just highlights and brings forth your beautiful blue eyes, blonde hair and fair skin; you really do look like such a beauty! I love your new skirt, the idea of it is trendy, but the style is a bit more unique, since it has the two large pockets on the front. I tend to see more of the plain denim button up versions, so this really was a great score! I love how you paired it with the blue jumper and that choker. This look is one that's definitely a nod to the '90s, styled perfectly! Thanks so much for sharing, beauty, and I hope you're having the best start to your week so far! Head-to-toe perfection, Gabrielle! I absolutely love this outfit, the denim skirt is PERFECT for transitions and I can see it being styled in so many different ways. Plus, I love the delicate rings you're wearing! You are seriously barbie come to life and even better! I love the outfit and I also share this emotionally attachment to Zara. Once I get into the store there's no stopping me! I love Zara too but your Gap jumper is lovely also. I also like your rings. You are pretty! I love knit jumpers too! They's so cozy aren't they? I love how you paired this one with that lovely denim skirt...and those boots are divine. Such a cute blue sweater and denim skirt! Love the combo. Oh gosh! This outfit is simply gorgeous! Denim, chocker and amazing hair? Yes, yes, yes please! You look so gorgeous girl!! Love the way you mixed this (perfect) denim skirt with the jumper. I would love to see more outfits from you Gabrielle! Hey! You look awesome girl I am amazed by your hair. Sorry I haven't been so active on your blog lately - I've been super busy. A friend and I created an app called Watcher, it's a safety app for people who are afraid to walk home alone at night. Through some terrible experiences of my own (http://danikamaia.com/watcher-safety-app) I've learned you can never be too cautious and I'm super excited to share this new project! If you've every been scared walking home alone at night, I'd love if you could help me in spreading the word about Watcher so we can build a community of people looking out for each other. Love your skirt Gabrielle! You look perfect! Beautiful mani and gorgeous hair! Oh gosh you are gorgeous, gorgeous, GORGEOUS! So pretty! Love the post! Wooow ! I really love this look. Your skirt is so trendy. I seriously need to start adding dark denim in my wardrobe. this look is so stylish and looks comfy at the same time. I am loving the return of denim skirts! This is such a retro-modern chic look!